an astronomical clock inspired by the astrolabe, an ancient astronomical instrument used to tell time and to predict the location of the Sun, stars and planets. This modern interpretation gives a view of the sky showing at a glance the time of day, day of year, and the location in the sky of the Sun, Moon, planets and stars. Astrolabe Clock also gives the time of sunrise and sunset, the phase of the Moon, transit times for the Sun, Moon, planets and stars, and can be used to show the occurrence of solar and lunar eclipses. 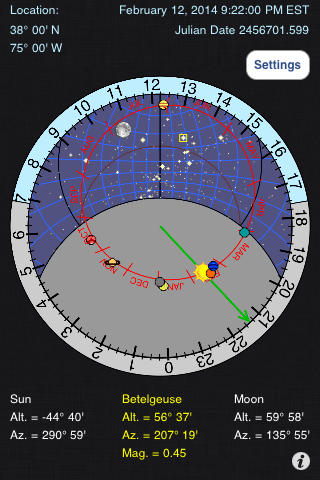 See the web site at http://www.twonineeightsoftware.com/AstrolabeClock.html or visit the iTunes app store.